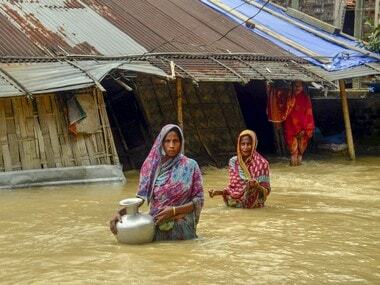 Guwahati: The flood condition in Assam worsened with two more people losing their lives on Wednesday, while nearly 60,000 people are affected by the deluge across five districts. 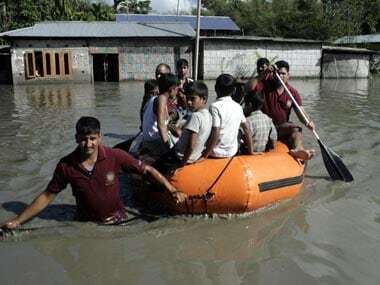 According to Assam State Disaster Management Authority (ASDMA), one person died in Dhemaji and the other in Golaghat districts in the flood related incidents. With this, the total number of persons losing their lives in the flood in 2018 across different parts of the state rose to 38, including three in landslides. ASDMA said over 58,600 people are affected at present in Dhemaji, Lakhimpur, Golaghat, Sivasagar and Charaideo districts. Till Tuesday, over 47,800 people were affected at in three districts across the state. 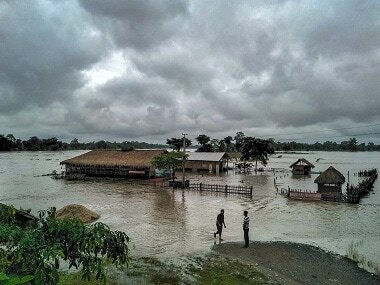 As per the report on Wednesday, Golaghat is the worst affected with over 24,000 sufferers, followed by Sivasagar with almost 17,500 people affected in the deluge. "Currently, 168 villages are under water and 3,139 hectares of crop areas have been damaged," ASDMA said. ASDMA said authorities are running 47 relief camps and distribution centres in three districts, where 10,575 people are taking shelter at present. Currently, Brahmaputra at Nimatighat in Jorhat, Dikhow at Sizasagar town, Dhansiri at Numaligarh in Golaghat, Jia Bharali at NT Road Crossing in Sonitpur and Beki at Road Bridge in Barpeta are flowing above the danger mark. "Embankments, roads, bridges and other infrastructure were damaged in Lakhimpur, Kamrup Metropolitan, Sivasagar and Sonitpur districts," ASDMA said.